Through the keyhole of a door-bolted wine cellar in a country estate, a man is seen sprawled. Dead, not drunken. After the hinges are removed and death confirmed, many in the gathered crowd assume heart attack, only for the doctor to later proffer poisoning, kick-starting an unwanted police investigation. A locked room mystery in a country manor? It sounds like the start of a classic Agatha Christie or Ngaio Marsh mystery from the Golden Age, but in reality this is the set-up for a delightful tale from a modern-day Italian crime writer - although it is set in 1890s Tuscany. Elderly merchant Pellegrino Artusi, a famed writer of cookery books, is one of two guests invited to visit a Baron's castle in Tuscany for a boar hunt and a few days relaxation (the other is a photographer). Artusi, who has travelled far and wide throughout nineteenth century Italy sampling cuisine for his tome The Science of Cooking and The Art of Eating Well, is keen to learn the secrets of the Baron's kitchen. Instead finds himself caught up in a troubling murder mystery when the Baron's young butler is found dead in the cellar beside a port wine glass. The arrival of a policeman puts everyone on edge, and fingers are pointed in various directions by the Baron's spoiled and lazy sons - one a lothario, the other dreams or being a famous poet - including towards Artusi himself. Then someone tries to shoot the Baron on a boar hunt, and Artusi must use his own highly attuned senses to uncover who's the true cause of all the violence. THE ART OF KILLING WELL is a deliciously enjoyable tale - moreish without leaving you feeling overstuffed. It's relatively short, at less than 200 pages, and is a smooth, smile-inducing read. Malvaldi peppers the story with plenty of mischievousness; it's almost like the author and narrator both have a wee smirk on their face throughout. The setting in nineteenth century Tuscany adds some extra flavour: Italy has just been unified, and all the regional and class prejudices are on show as the characters are coming to grip with the changing face of a modernising nation. It was a time where the old pastoral fiefdoms were mixing with the increasing industrialisation of the world, changing work and leisure for everybody. 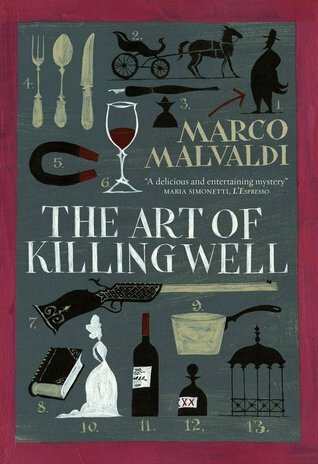 Malvaldi manages to craft a story that follows the classic cosy murder mystery recipe while also sprinkling something fresh and tasty for modern readers. There's an eclectic cast of memorable characters ensconsced at the castle, from the boorish libertine Gaddo to a dog-loving elderly Signorina who sees potential husbands at every turn, and Malvaldi provides plenty of suspects, red herrings, and twists to the murderous dish. A very enjoyable read from a talented writer. I bought this delightful book from the Milan airport bookshop, after unsuccessfully scouring for some translated Italian crime fiction during my two-week road trip through northern Italy (the two English-language bookstores in Florence were both closed for summer vacation). Every time I travel abroad, I search for local crime fiction in English.